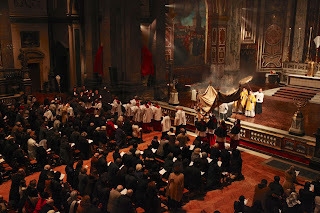 "Benedict XVI Put Liturgy Front and Center"
CNA: "Oriented Toward Gregorian Chant"
From all of us here to all of you and your families, wishing you a very happy Easter day, octave and season. 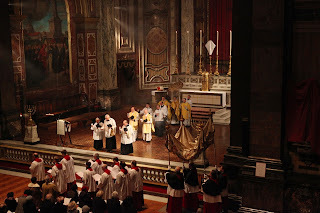 Pictures taken with permission from our friends at the excellent Spanish forum Ceremonia y rúbrica, where you can find more photos (and where in the same thread you will also find the liturgical texts from the Roman Pontifical). Βασιλεύει, ἀλλ' οὐκ αἰωνίζει, ᾍδης τοῦ γένους τῶν βροτῶν · σὺ γὰρ τεθεὶς ἐν τάφῳ, Κραταιέ, ζωαρχικῇ παλάμῃ τὰ τοῦ θανάτου κλεῖθρα διεσπάραξας, καὶ ἐκήρυξας τοῖς ἀπ' αἰῶνος ἐκεῖ καθεύδουσι λύτρωσιν ἀψευδῆ, Σῶτερ, γεγονὼς νεκρῶν πρωτότοκος. 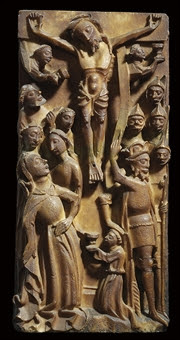 Following on from last week's relief carvings of the Entry in Jerusalem, here are some images relating to the Passion: two Western 15th century relief carvings appropriate for Easter - the crucifixion and a deposition; and late gothic painting of a deposition. The carvings are English in a gothic style (where there was no Renaissance). 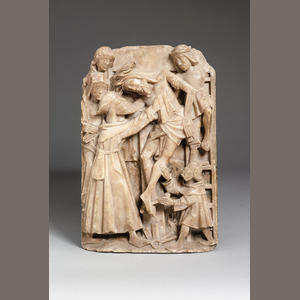 They are carved in alabaster which was quarried in Nottinghamshire. 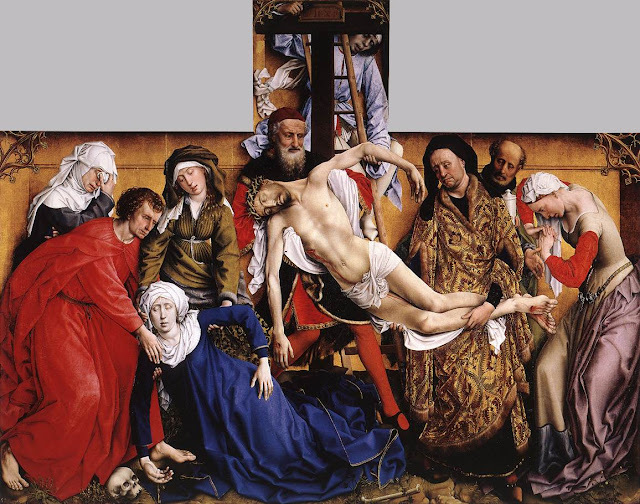 What is interesting is that when painting in the same century, the Flemish artist Rogier Van Der Weyden painted his figures as though they were occupying a foot-wide space projecting out to plane of the painting. Employing, very clearly, a far greater degree of naturalism than the English sculptors did, he nevertheless painted a backdrop so as to eliminate the chance of the illusion of too great a depth. All of this helps to ensure that there is a balance between adherence to natural appearances, which communicates visual realities; and stylization through some departure from strict naturalism, which lends a symbolic quality to the image and communicates invisible realities. Keeping the image to a space that doesn't deviate far from the plane of the painting and restricting the illusion of depth communicates the presence of the heavenly dimension, which is outside space (and time). 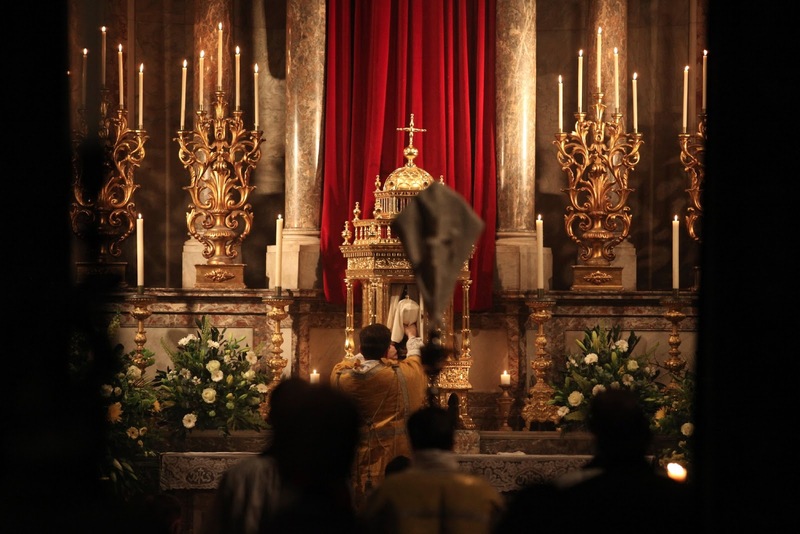 One of the most beautiful things about Holy Week in Rome is the long-standing popular custom of visiting the Sacrament Altars (often called “sepolcri - sepulchers” in Italian) of seven churches on the evening of Holy Thursday, a practice to which is attached a plenary indulgence. Here are some photos of a few of the better ones. 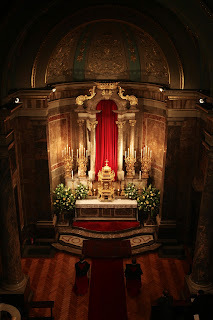 (The Italians traditionally put a lot of lights around the Altars, making things more difficult for a very amateur photographer like myself.) 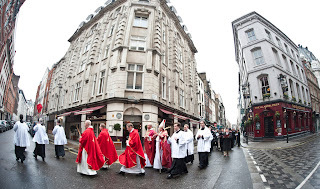 One of the things I like best about this custom is that one also sees a huge number of pilgrims from various nations participating in this; the Italian newspapers say that there are a quarter as many more pilgrims in Rome this year for the first Holy Week of a new Pope. I ran into a group of American students from Notre Dame, and of course heard a great deal more Spanish being spoken than usual. It is a true grace to see the Universal Church keep watch and pray with the Lord on the night of His Last Supper. 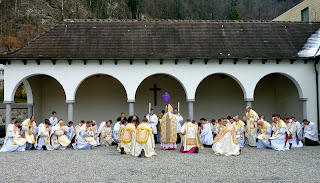 Ss.ma Trinità dei Pellegrini, the Fraternity of St. Peter’s Roman Parish, before the Procession with the Blessed Sacrament. 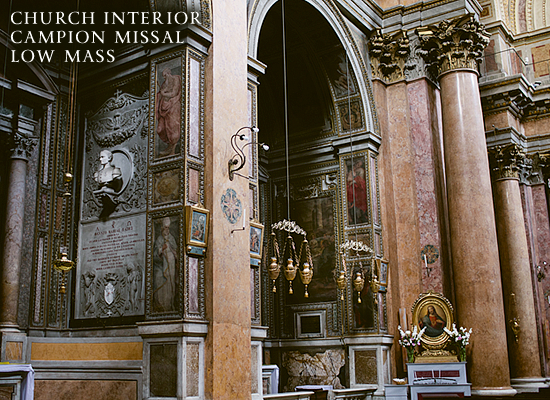 Santa Maria in Vallicella, popularly known as the “Chiesa Nuova - the New Church”, the Roman Oratory. The Paschal moon competes with the lights of the city to be seen in the piazza outside Chiesa Nuova. Santa Maria degli Angeli e dei Martiri, the former Carthusian monastery church of Rome, in the Piazza della Repubblica. 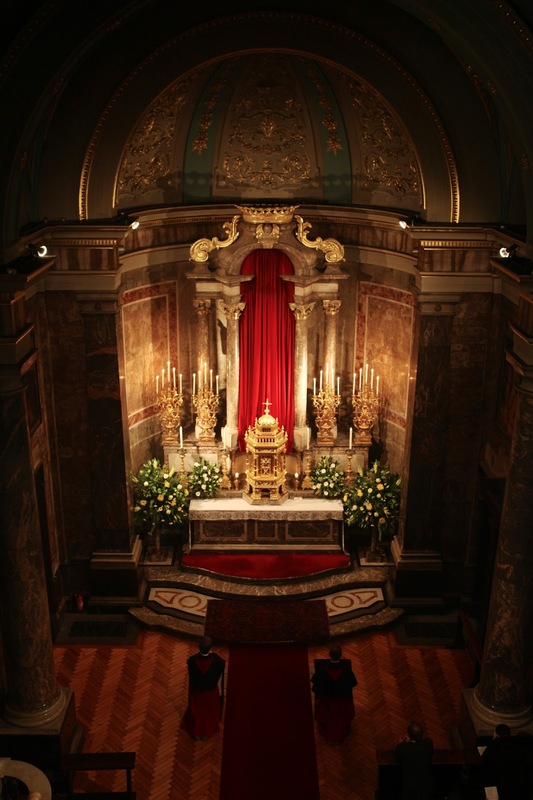 The same altar seen at a distance from the cavernous nave designed by Michelangelo. San Martino ai Monti, one of the oldest parishes in Rome, originally a house church founded in the third century; now home of the generalate of the Carmelites of the Old Observance. Santa Maria in Domnica, an ancient diaconia, i.e. church originally administered by a deacon as a center for charitable works, first built in the 5th century. 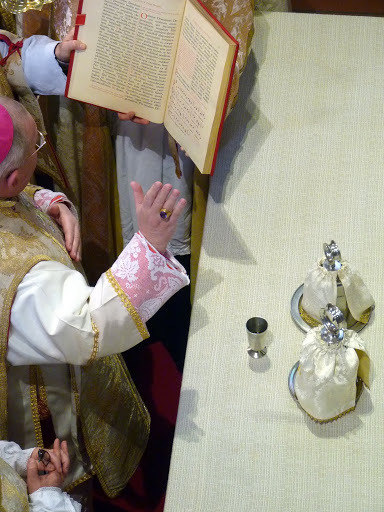 The table of the Plashchanitsya in the church of the Pontifical Russian College, or “Russicum”, which is dedicated to Saint Anthony the Abbot. 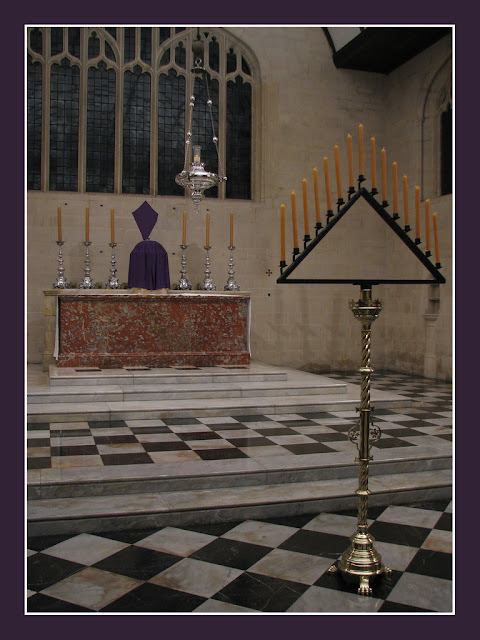 Not of course a Sacrament Altar, but often mistakenly venerated as such by pilgrims unfamiliar with the Byzantine liturgy. 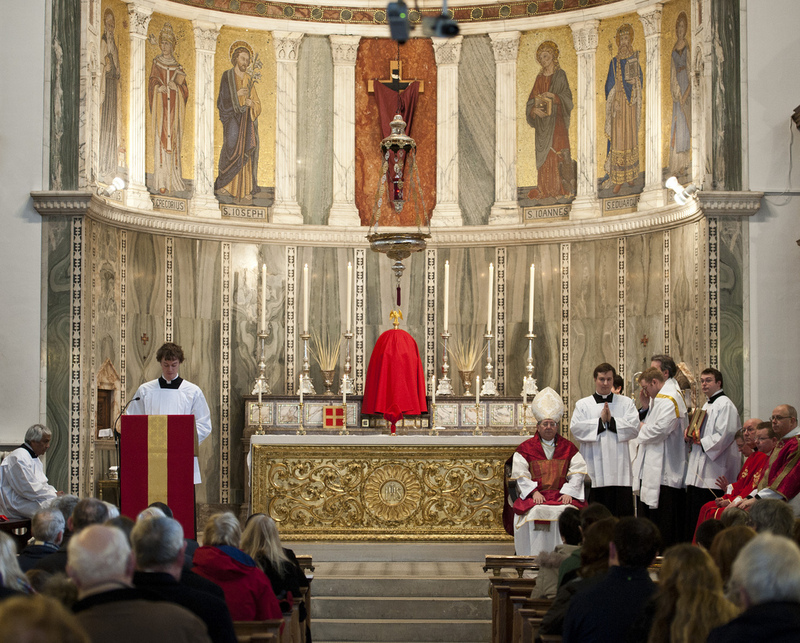 The same set up earlier in the day in preparation for the Matins of the Twelve Gospels. 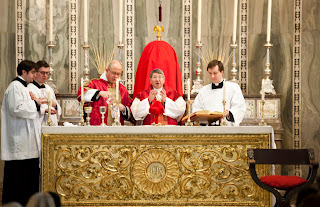 Charles Cole provides some wonderful photos from Maundy Thursday at the London Oratory. Enjoy. 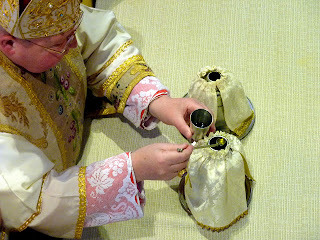 This post and our next for today are going to be musically focused as it seems a good way to enter into the Triduum. 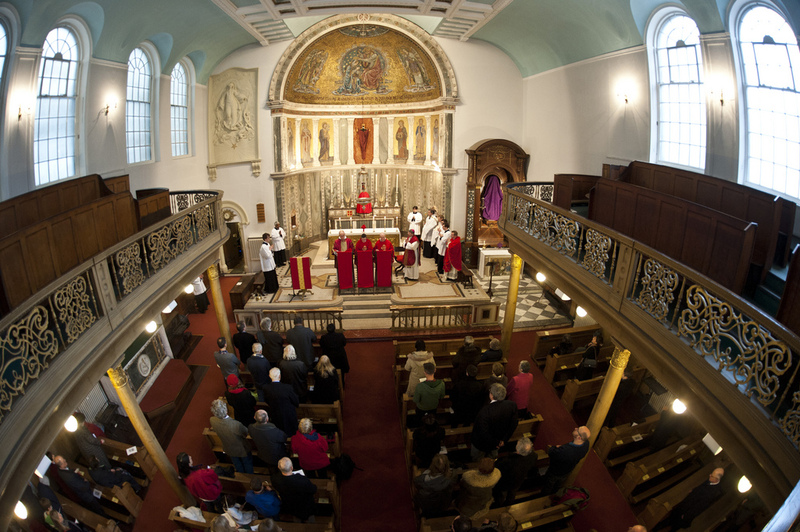 For the first such, we present Victoria's First Lamentation for Maundy Thursday, sung by the Tallis Scholars in the chapel of Merton College, Oxford. 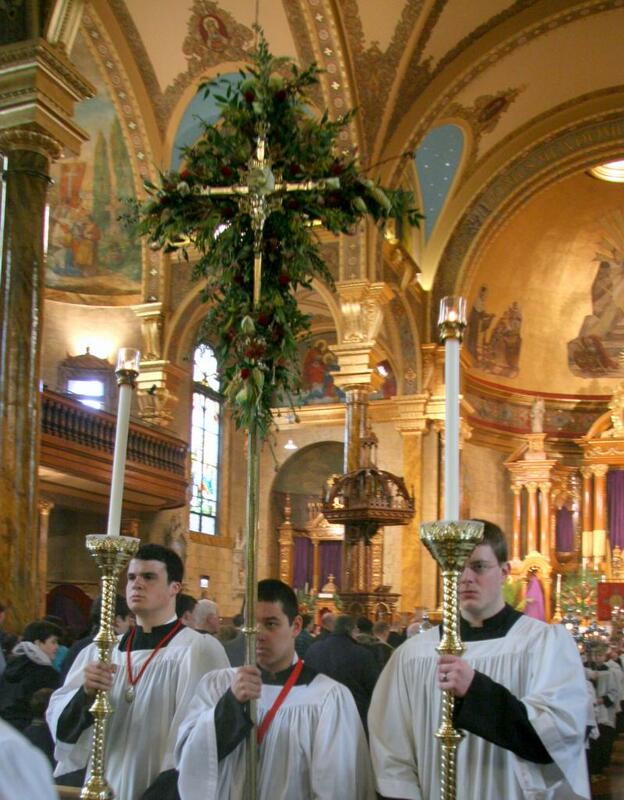 Our final Palm Sunday considerations come from Ave Maria University where they celebrated a Missa Cantata. Here are a few photos from the event. Fr. 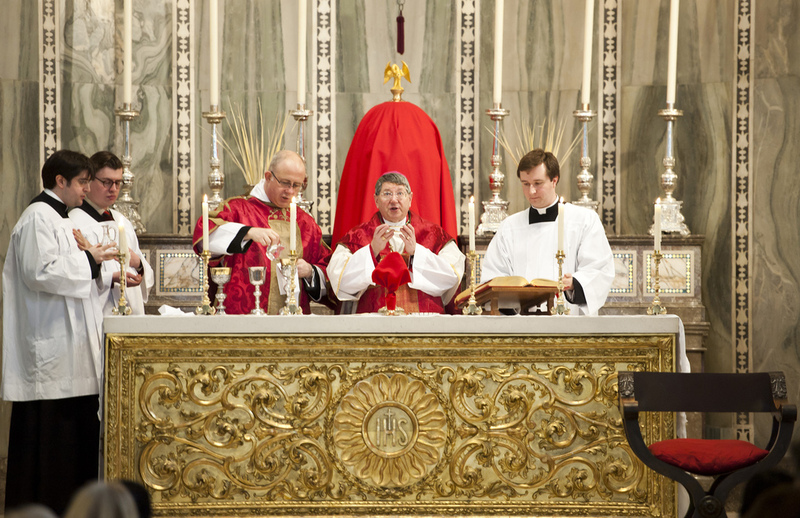 Robert Tatman, administrator of the Quasi-Parish of Ave Maria Oratory, celebrated a High Mass for Palm Sunday in the usus antiquior. The propers and ordinary were sung by the combined Scholae of Ave Maria University, directed by Dr. Susan Treacy, professor of music at the university. Approximately 250 people attended the Mass and procession. The students of Ave Maria University are blessed to have three Masses in the Extraordinary Form per week: Tuesday and Thursday mornings, as well as Sundays. 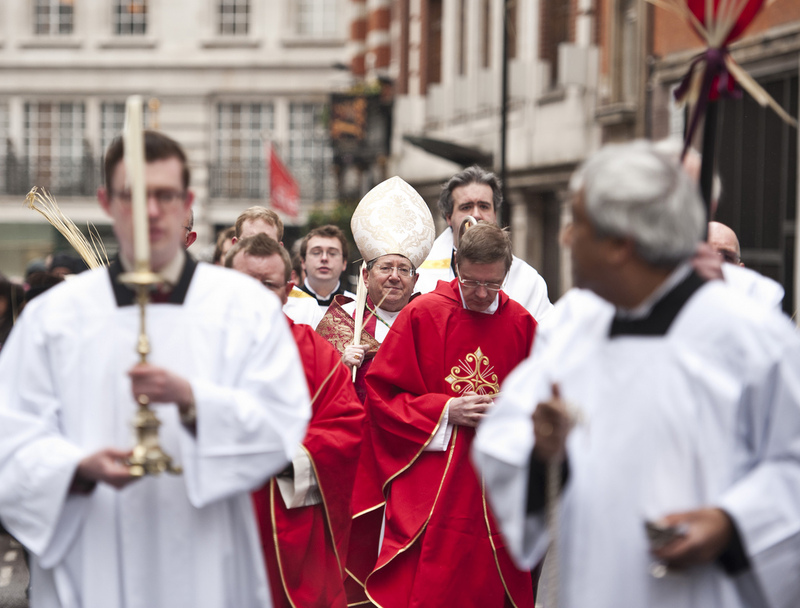 There are several Sung Masses per month, chanted by the men’s or women’s schola. 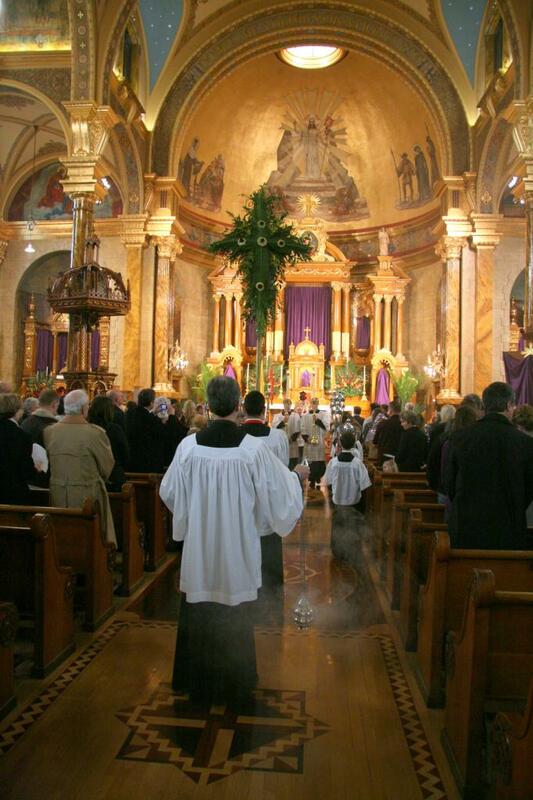 In addition to weekly Masses, the Ave Maria music department sponsors an annual Solemn High Requiem Mass. This past year, the AMU Chamber Choir sang Mozart’s Requiem. 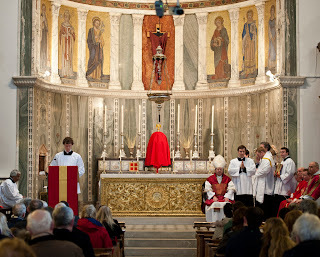 There are currently efforts to increase the number of Masses celebrated in the usus antiquior at the Oratory. The Palm Sunday photos really seem to be rolling in now. Here are some from the Canons Regular of St. John Cantius in Chicago. A grown tree looks different from a seedling yet remains the same tree. 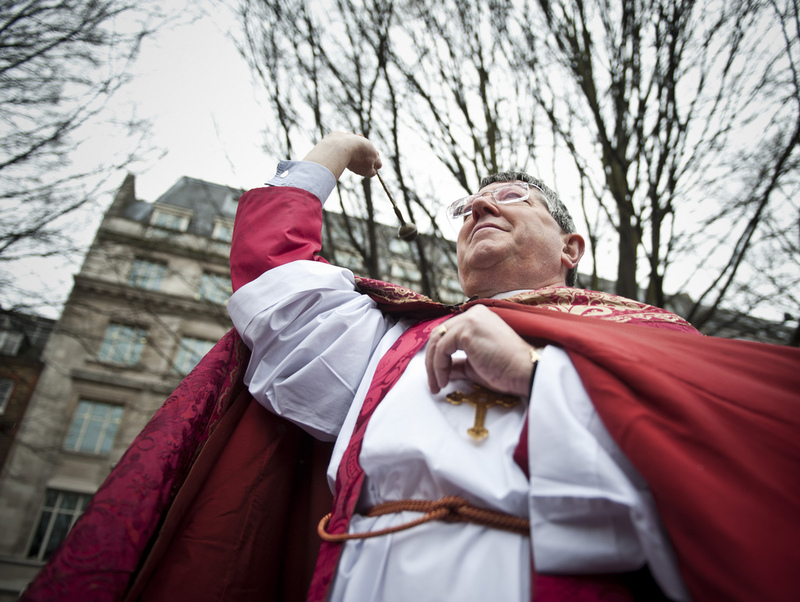 Throughout the history of the Catholic Church, there have been developments, but the fundamental dogmas never change. 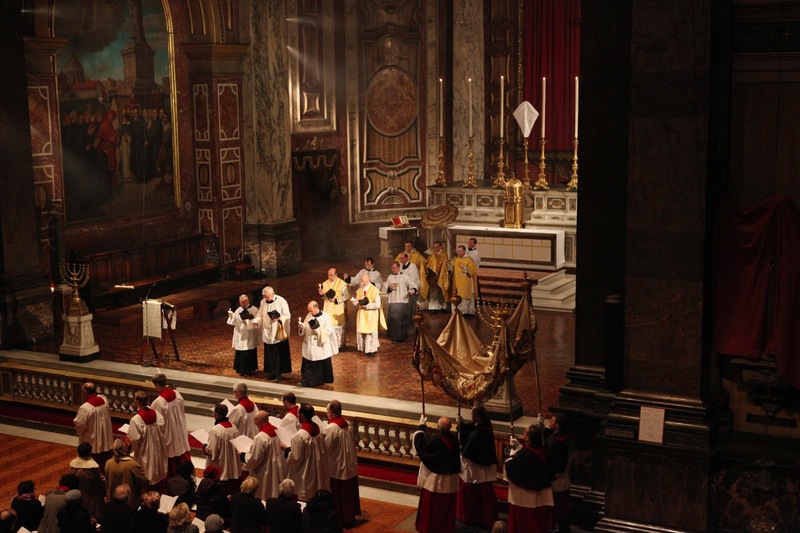 Pope Benedict XVI reminded us in a 2003 interview (without a translator): "We are today not another Church as five hundred years ago. It is always the same the Church. 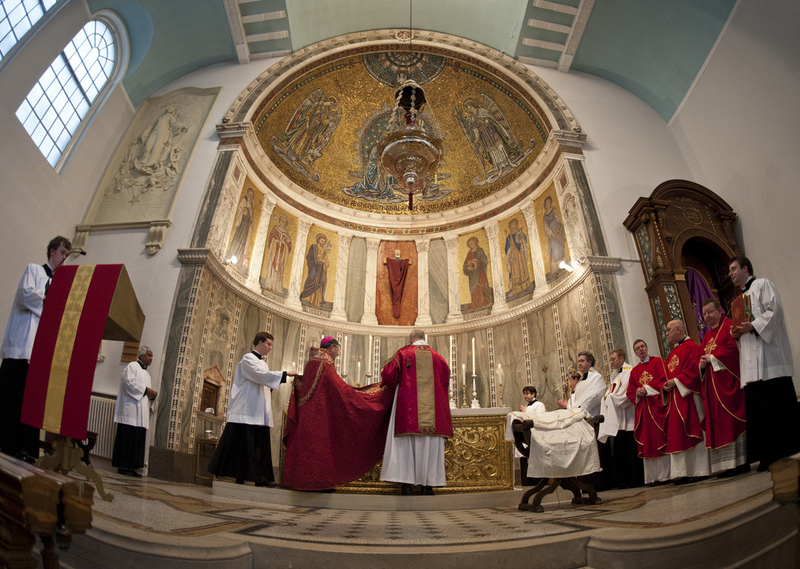 What is one time holy for the Church is always holy for the Church and is not in another time an impossible thing." Four years later, in the letter accompanying Summorum Pontificum, Pope Benedict echoed his earlier statement: "What earlier generations held as sacred, remains sacred and great for us too, and it cannot be all of a sudden entirely forbidden or even considered harmful." 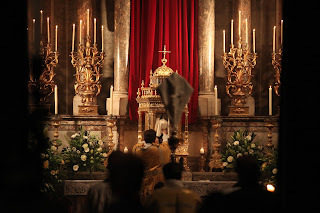 The Catechism of the Council of Trent (1566) had this to say about the ceremonies of the Mass: "The Sacrifice is celebrated with many solemn rites, none of which should be deemed useless or superfluous. 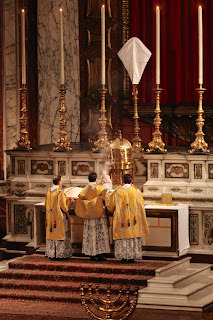 On the contrary, all of them tend to display the majesty of this august sacrifice, and to excite the faithful, when beholding these saving mysteries, to contemplate the divine things which lie concealed in the Eucharistic Sacrifice." It can be difficult for those of us living in the year 2013 to understand the precise way our ancestors in the faith participated in the Latin Mass. The Romance languages underwent long periods of development and instability. Latin, on the other hand, was quite stable and allowed priests from all over the world to communicate with ease. 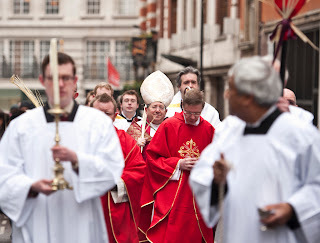 Furthermore, its clarity was helpful in codifying precise doctrinal statements. It might be helpful to remember that any literate man in the middle ages could read Latin. If a man could not read Latin, he could not read at all. Around the time of the Council of Trent, the Church had certain concerns about vernacular translations of the Roman Canon. As Fr. 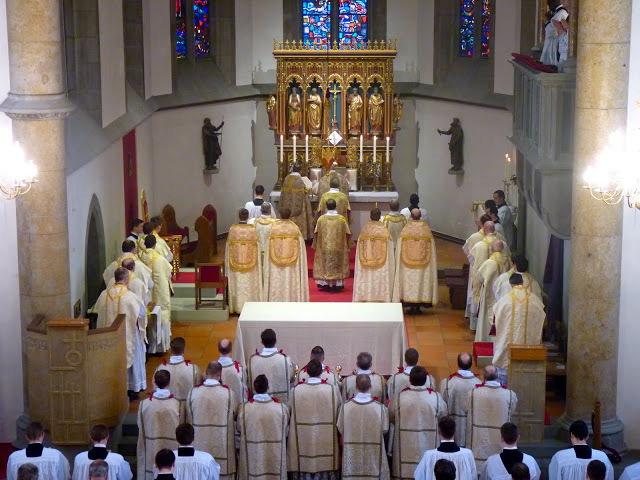 Giles Dimock, O.P., has written: "The Tridentine Fathers encouraged the printing of prayer books to follow the Mass as long as the canon was not printed." 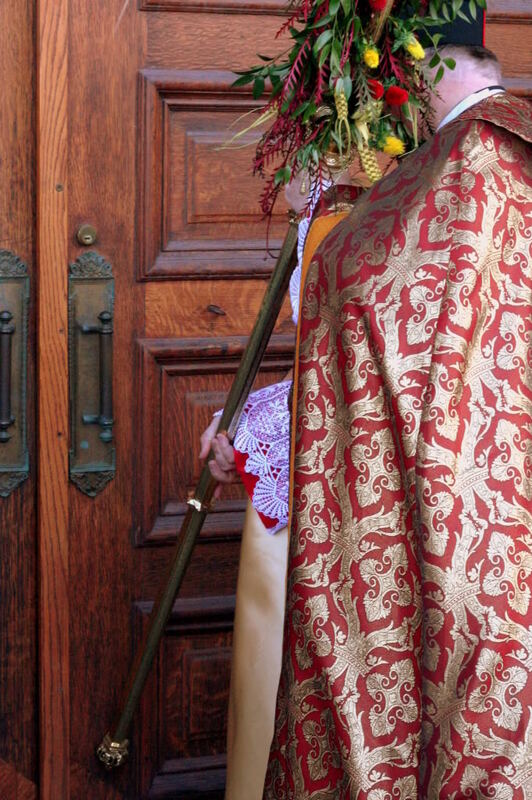 A century later, in 1661, Alexander VII would place rather strong restrictions on vernacular translations of the Mass, presumably out of a sense of reverence for the most sacred Canon (c.f. Joseph Jungmann, Missarum Sollemnia, Vol. I, 143). 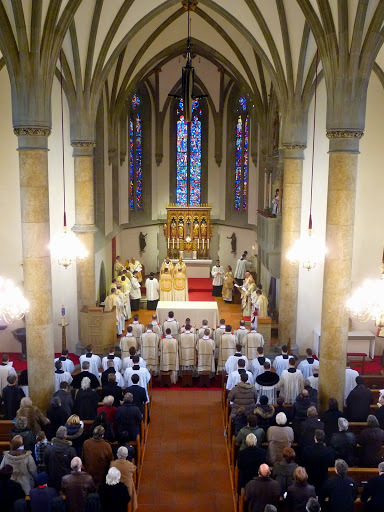 On the other hand, Jungmann cites numerous early vernacular translations, such as Burchard's Order of Mass (1502) and a handbook on how to properly assist at Mass by Volusius (1660). 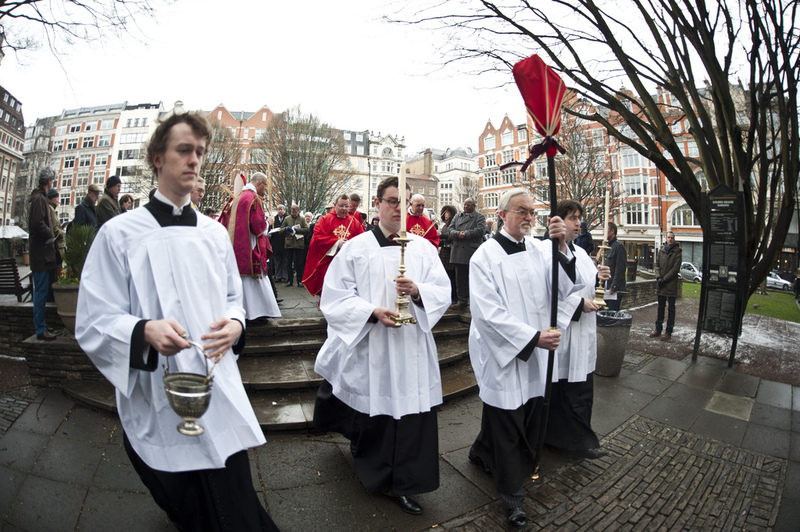 He continues (p. 143): "Even in the late Middle Ages, translations of the missal, with or without the canon, appeared. Vehlen, p. 89, mentions two manuscripts and one printed translation from the century before Trent. 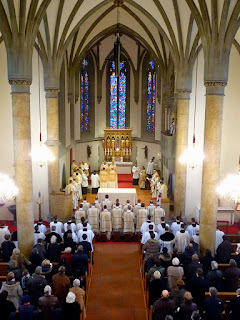 The little exposition of the Mass published in 1480, Messen singen oder lesen, included the canon; later editions left out just the words of consecration." 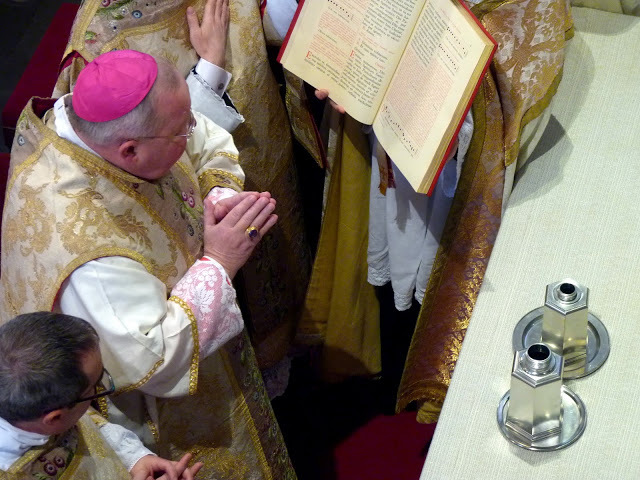 Many readers know that as time went on a desire arose for the congregation to participate with ever greater understanding at Mass, and Pope Saint Pius X was a major catalyst. This is generally referred to as "The Liturgical Movement." 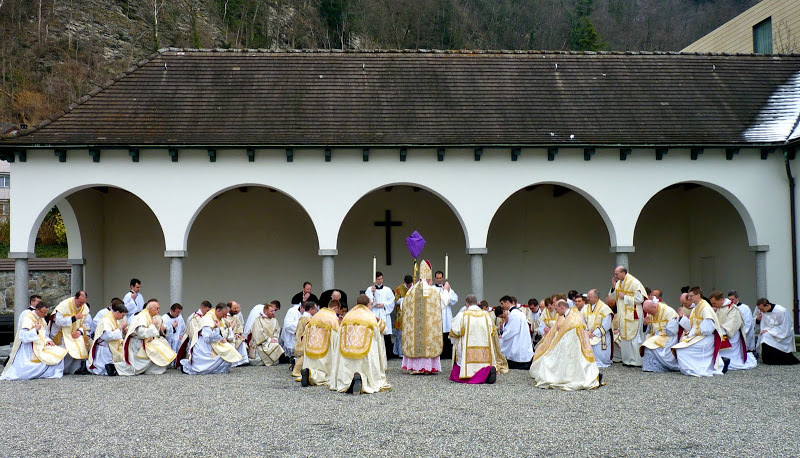 It always struck me as odd that in the 21st century, with so many advances in technology, we could not do a better job of presenting participation materials for Catholics attending the Extraordinary Form. 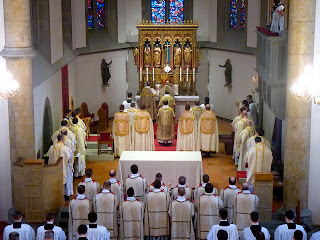 For this reason, Corpus Christi Watershed created the St. Edmund Campion Missal & Hymnal for the Traditional Latin Mass (ccwatershed.org/Campion). 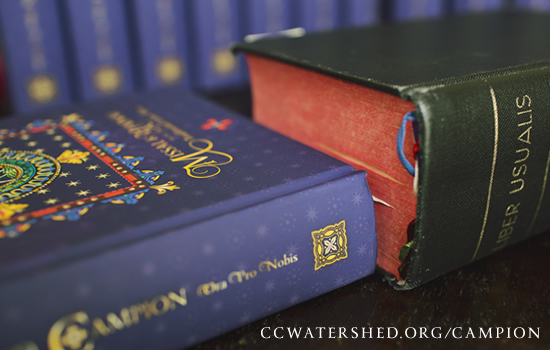 The Campion Missal & Hymnal was designed for use by congregations, but I have been pleasantly surprised at the number of individuals who have purchased it for personal use. 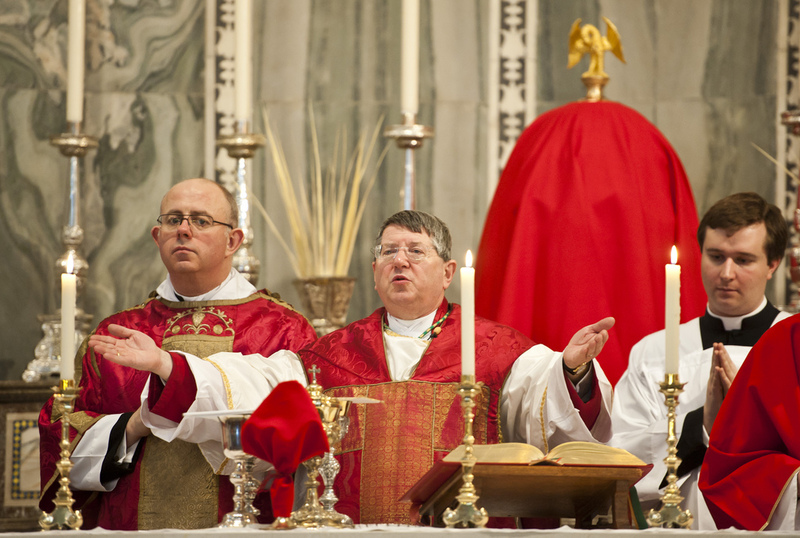 People have also written to us claiming the Campion Missal is a wonderful way to "evangelize" with regard to the Extraordinary Form. Not a few Churches have purchased additional copies for their bookstores and report that almost immediately they have completely sold out. A priest from another country told me, "Your book is so beautiful, it would be an insult to the contents to sell it for less than $50.00 each." He then ordered a whole bunch of copies and payed $50.00 each (instead of $17.99) because he insisted that anything less would be an insult. We've also had reports that people find the books so beautiful they are stealing them from the pews . . . but I'm never quite sure what to say about those instances! 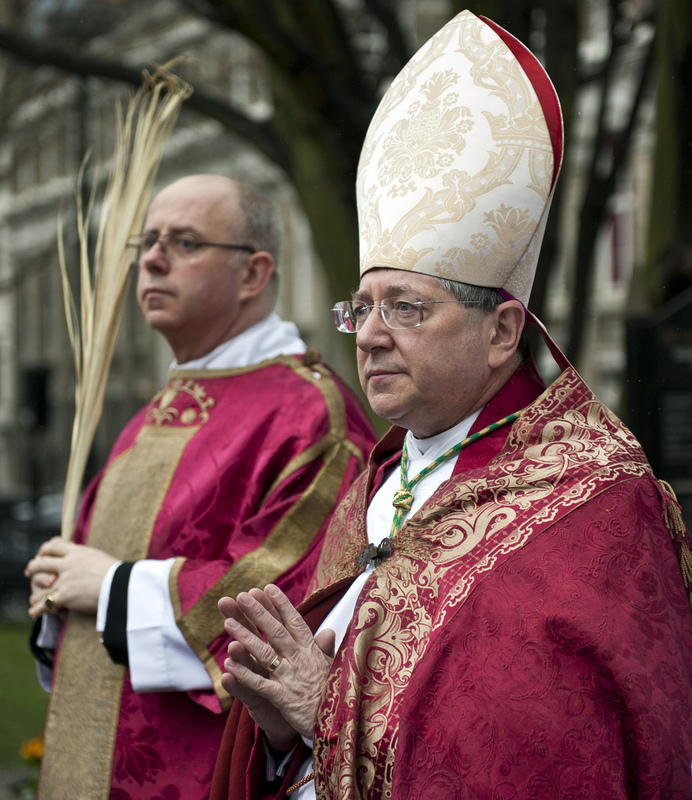 The celebration of the ceremonies and Mass for Palm Sunday in the Lord's Passion were presided over by the Ordinary of the Personal Ordinariate of Our Lady of Walsingham, Mgr Keith Newton. 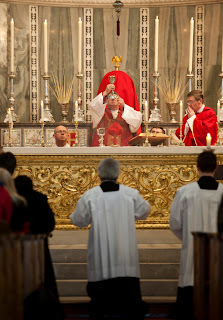 This was the first Mass celebrated by the Personal Ordinariate in the beautiful and historic church of Our Lady of the Assumption and Saint Gregory, Warwick Street, which has been dedicated to the life of the Personal Ordinariate by the Archbishop of Westminster. As the liturgy serves both the diocesan and Ordinariate faithful, the Ordinary Form of the Roman Rite was used with propers from the Anglican Use Gradual, hymns from the English Hymnal, and polyphony by Palestrina and Guerrero"